TSC is a tricky condition. You never know what emergency will pop up next. It renders you helpless. Our biggest concern at the moment is Nami’s seizures. We keep playing merry-go-round with anti-epileptic medications. We never seem to be able to find the right combination of medications. The doctors have told us he’s medicine resistant. Some combinations partially work, but only for a while. Then the seizures get increasingly worse again and we go back to playing guessing games with medications. Is it possible for your body to go into a sort of shock, even if you haven’t been physically harmed? I am alive but somehow out of my body. I think it’s my body’s way of dealing with our situation. What used to be a bad day has become our every day. Over the past few months Nami has been having 20-40 seizures a day. Recently he has had upwards of 100 seizures on some days. 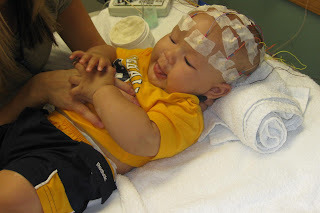 They have gotten to the point that at the beginning of each seizure he stops breathing for a few seconds, gasps for air, and then continues the seizure for a minute or two. I have to run over to him and catch him before he falls. He spends his days disoriented and off-balance…falling all over the house. He’s cranky, but who wouldn’t be in this situation? Even as I write this, I can’t believe this is our reality. I can't believe I watch my son stop breathing multiple times a day, every day. Nami is currently on 4 medications and is receiving rescue medicine in addition to those. It doesn’t seem safe, but neither does watching him continually seize. I want to fix my child, but I can’t. I titled the blog “Life As It Happens…After It Soaks In” because I think it’s important to let things settle before making any conclusions. It lessens the likelihood of saying something that I may regret later. I have to admit, I am writing this post before letting it soak in. This is the first EEG that detected seizure activity. Countless EEGs have followed. Hang in there. Your honesty is very touching. Thank you for this thought provoking, well written blog.. My daughter has TSC as well. I will be praying for your family. Take care. Thank you for your support. Thoughts and prayers for your daughter and your family.